Children are taught the benefits of observing carefully and concentrating. If they don’t watch what is happening, they can’t respond to it adequately. Children are taught to think first and then act. We teach them to think moves ahead. 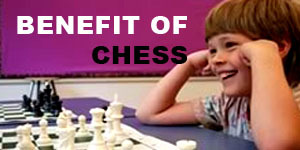 Over time, chess helps develop patience and thoughtfulness. Children are prompted to imagine a sequence of moves and actions before it happens. We actually strengthen the ability to visualize by training them to move the pieces in their mind, first one move and then several moves ahead. Children are taught to develop long range goals and take actions to achieve it. They are also taught of the need to reevaluate their plans as new developments change the situation. Enhances mathematical and logical abilities.